Hope everyone had a great Father's Day weekend. I know I sure did, despite being thoroughly showed-up at horseshoes by my stepdad, my dad and my 77 year old grandfather all in one day. The "W" goes to Team Pops. 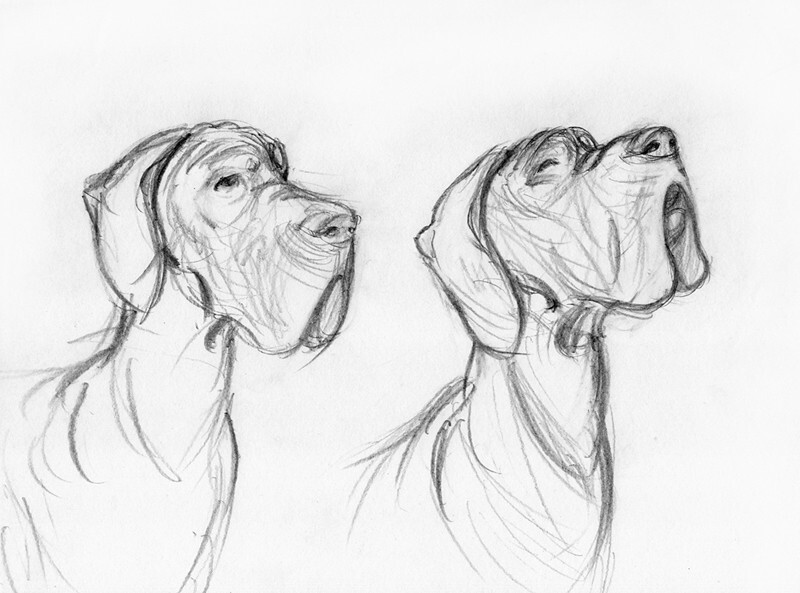 Anyways, here are a couple more sketches I did of our curious and adventurous young great dane. A little while back I taught an Introduction to Illustrating Comics workshop over at Salisbury University. This was the first class I'd ever instructed and as one could guess it was quite interesting. The experience overall was extremely cool. Having the chance to talk about a topic like comics, which I'm rather passionate about, and to explain the process of actually illustrating a comics' page was nothing short of great. Since graduating high school I've kept in decent contact with one of the great positive influences in my artistic life - that being my high school art teacher, Michael Morris. Mr. Morris was one of the 3 teachers who taught the VPA (Visual & Performing Arts) program I was apart of in high school, which eventually lead to me going to college at MICA. Like I said, a VERY positive influence. I told Mr. Morris about the Intro. to Comics class and it turns out he mentioned it to his current VPA students, so a number of them made an appearance. It was tremendously gratifying being able to give back in some way to a future generation of artists who are coming up & beginning from one of the very places I consider to be a milestone in my life. It also turns out that Mr. Morris himself showed up for the class AND considering I was the "authority" this time around I decided he was required to participate. So I "made" him do the assignment. Good stuff, right? In VPA we focused mostly on the Fine Arts so having the opportunity to bring comics to not only VPA students but my former teacher was, as you could expect, quite the treat. 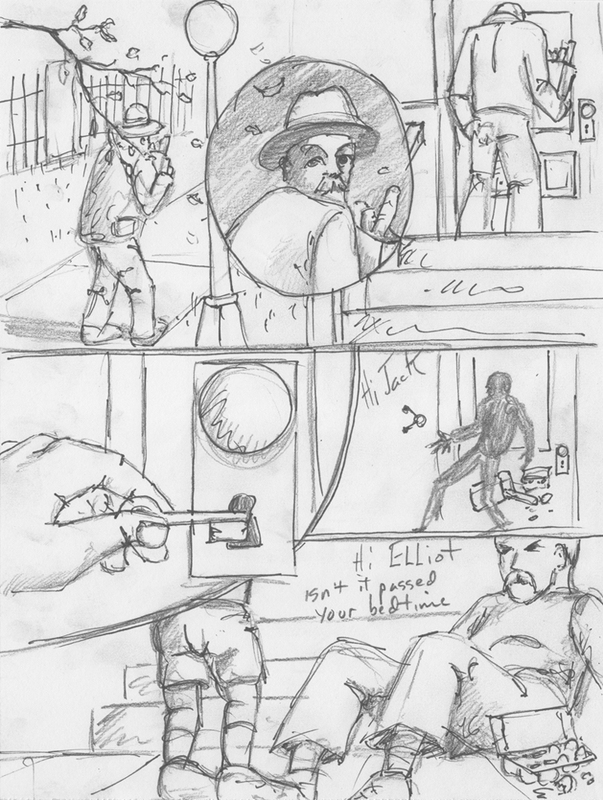 I gotta say too for his first ever comics page it's pretty impressive (show off lol). Whatsup all, this Friday I'll be setup at the always entertaining, always lively and most enjoyable local arts & music event, Salisbury's 3rd FRIDAY! If you've yet to partake in the goodness that is 3rd Friday this is the time. I'll be there with bells on (or not) with comics, including LAST CARESS, my newest sequential effort, AND original art as well sketches per your kind requests. Last Caress | AVAILABLE NOW! Just wanted to pass along a tidbit of tasty information... LAST CARESS, the newest comic from horror author Sam Costello and yours-truly, is available right NOW... RIGHT HERE! Yes, you heard correctly, it's right HERE for the viewing - that is, the first 16 pages. Split Lip Comics has been publishing one page online every Tuesday & Thursday and they're now 2/3 of the way there with yet another page coming, you guessed it, tomorrow! I wanted to wait until there were a sizable number of pages to be read before announcing - that way you can sink you're teeth in just before being teased to wait until another Tuesday or Thursday. Yeah, I'm that kinda guy. Last Caress is the tale of Sybil, a woman in her late 40's running a modeling agency in Manhattan. A woman not terribly pleased with life and one hard-pressed to wear a smile. Though that's not the only thing unusual about Sybil. She see's things a little differently. She see's people differently. In an industry that's hellbent on the next young thing through he door Sybil's view of the world has skewed around her towards the furtherest degree... "Everything looks... desiccated, ancient". That is, until she see's Sun Yoo. I have to say this as been an incredibly fun comic to illustrate. If you're familiar with my previous comics you'll probably see I took a different approach towards the art. Utilizing some old friends of mine - the pen and the marker. This is the first time I've taken this approach to a comic and I think Last Caress was the perfect fit for it. Trying to punctuate certain aspects of the story using a graphic, high contrast look with a gritty, loose feel. Much fun for myself and I think you'll enjoy it as well. For Mr. Sam Costello Last Caress was inspired by the song of the same name by the Misfits - and one verse in particular really triggered Sam's mind to begin turning and churning out this rather wicked tale. Which verse? Anymore than that I can't tell you. You'll just have to discover it yourself! And for those of you eager and maybe even slightly impatience folks (it's okay, you can be honest. We're all friends here) Last Caress in it's entirety is available for purchase in Split Lip's 4th volume, "SPLIT LIP: LAST CARESS and OTHER STORIES"! Just visit the STORE section of their site, or simply click HERE, and you can pick up not only Last Caress but a slew of other stories from the mind of Mr. Sam Costello. Just wanted to post the cover I did for the comic entitled DEADLESS. A tale told by the talented and up & coming writer Mr. Matt O'Keefe. 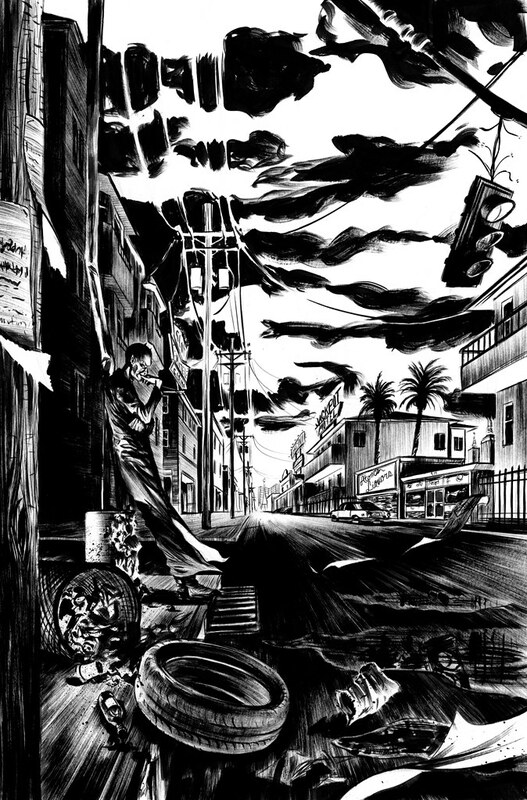 Demons, gritty streets and Las Vegas. What's not to love? This piece is in fact for the cover of issue #0, which consists of four short tales revolving around the origins of the characters that make up DEADLESS - each story illustrated by a separate skillful artist. The good part? The complete issue #0 can be read online for FREE. The second good part? You can check out the masterful job my good pal and supreme colorist Jesse Turnbull did on not only coloring the cover (see stage left) but also on all 4 short stories. In the early 1700s Joseph Montgomery made a deal with the demon Azil that allowed him to live forever while still causing him to age. Centuries later, regretting his decision, he finds Azil and begs him for a way out. Azil offers one. In exchange for a year of servitude, he will lift the contract. What happens in Vegas, well, doesn't always stay in Vegas. Hope you enjoy and have a great weekend!